Did you know you can buy a gym LOCK that is Bluetooth capable? Bluetooth is becoming the way of the world. We’re finally starting to see cellular phones phasing out the traditional headphone jack. Nobody wants to deal with wires anymore. Since Bluetooth’s birth (v1.1) interpretation in 2002, the technology has become extremely reliable with the release of Bluetooth v5 in 2016. Without doubt, Bluetooth is here to stay and we will continue to see it in mobile devices for centuries to come. While Bluetooth technology continues to advance, so are Bluetooth capable devices. There has to be 1000’s of Bluetooth headphones available on Amazon now. Here is a pair of Bluetooth headphones going for as much as $1,300! I won’t be buying those even if I grew money. Today, Bluetooth offers outstanding affordability when it comes to Bluetooth capable product lines. This is because Bluetooth technology has improved on itself so much over the years. We inherited our very first pair of Bluetooth headphones 2 years ago. They were sealed new in box when we got them. You can find the pair of Bluetooth headphones we received free here. The sound and battery life were above par. Sound compared to the stock Apple headphones we used was the same. The cons of these Bluetooth headphones eventually sprung up. The headphones fell out of our ears just from simple walking after about a month of day-to-day use. The battery life really took a dive about 6 months after using them the for the first time. The headphones lasted a year barley. We switched back to the traditional Apple wired headphones that come with the iPhone after our first Bluetooth experience. After about 2 months of using the wired headphones, the coiled wire never would get “straight”. It got annoying enough that we pitched them because the wire coiling pulled the headphones out of our ears walking. We had enough. It was time to get back into Bluetooth world. Being an avid runner, jogger, and gym junkie, we wanted an affordable pair of Bluetooth headphones with detailed bass quality, noise reduction, and that would stay in our ears firmly. After days of research and careful consideration, we found a winner. 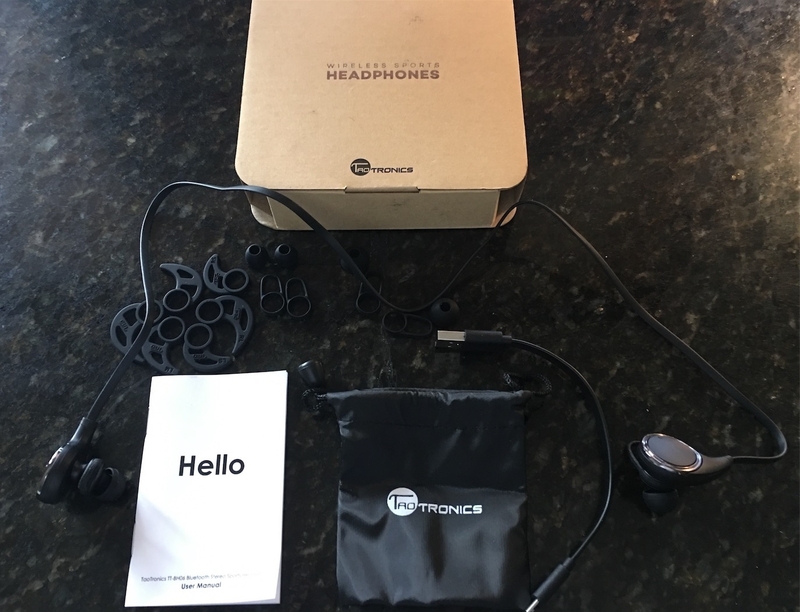 The Bluetooth Headphones TaoTronics Wireless Earphones for Running with Mic fit the description of our needs and some. For the price of $22.09 including free shipping these Bluetooth headphones are some of the cheapest you can find anywhere today. They are absolutely packed with power. The noise cancelation added a deep bass effect giving a nice surround sound experience. We thought the sound was better than the Apple headphones (which also have a nice deep bass). The volume on the TaoTronic’s Bluetooth headphones is well defined and crystal clear. Our battery power was equally impressive allowing us 6 hours of near max-volume listening. Also to note was the quick re-charging time. Finally, we were absolutely pleased with the ear fitting of these Bluetooth headphones. The default ear buds that were attached fit our ears comfortably. The perfectly snug fit allowed us to run on a treadmill and not even notice the earbuds moving. In conclusion, we expect the TaoTronics Bluetooth headphones to last us at least a few years. At the market price now, these headphones are an inexpensive replacement - should that time come. We are looking forward to using these audio drivers for casual and outdoor event trips. These are a highly recommend product and the voice of Amazon also critically acclaims these. You can order a pair of the TaoTronics Bluetooth Headphones here.